Isaiah Jones-Embry with his shot put throw of 44’ 0.5” at Blue Ridge High School this past Friday, April 5, 2019 has qualified him for the state meet in early May. His currently ranked 4th in Division IV ( includes 1A and 2A schools ). 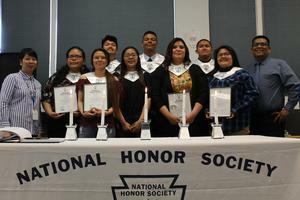 Congratulations to the new members of National Honor Society Dishchii'bikoh High School Chapter. Dishchii’bikoh Community School is excited to announce the opening of its new Preschool for the 2018-2019 School Year! Click here for updates on our National Honor Society members. Created by the High School Journalism Class. Press 1 to access the attendance hotline when you call the school for your child's absence or tardy.